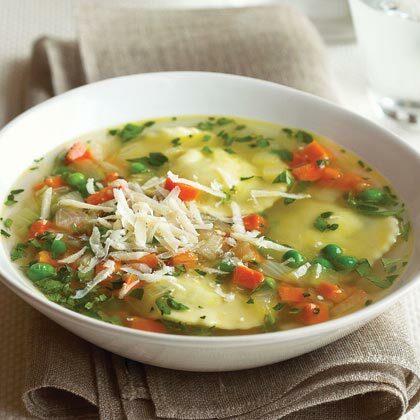 This pretty soup takes on an added delicacy if you use ravioli made with thinly rolled pasta, but it's good with the sturdier type too. Prep and Cook Time: about 25 minutes. Notes: Cooking time depends on the brand of ravioli you use; some take longer to cook than others. Follow package directions when cooking the ravioli in Step 3. Heat olive oil over medium heat in a medium pot. Add onion and carrots and sauté until onions are translucent and slightly golden and carrots are beginning to soften, about 7 minutes. Season vegetables with pepper. Add chicken broth to pot, raise heat to high, and bring to a boil. Add ravioli to boiling broth-vegetable mixture and return broth to a boil. Cook ravioli until tender to the bite (see Notes). During the last 4 to 5 minutes of cooking, add fresh peas (if using frozen peas, add at the very last minute), oregano, and thyme. Season to taste with pepper and stir in parsley. Ladle soup into wide, shallow bowls, sprinkle with parmesan, and serve.